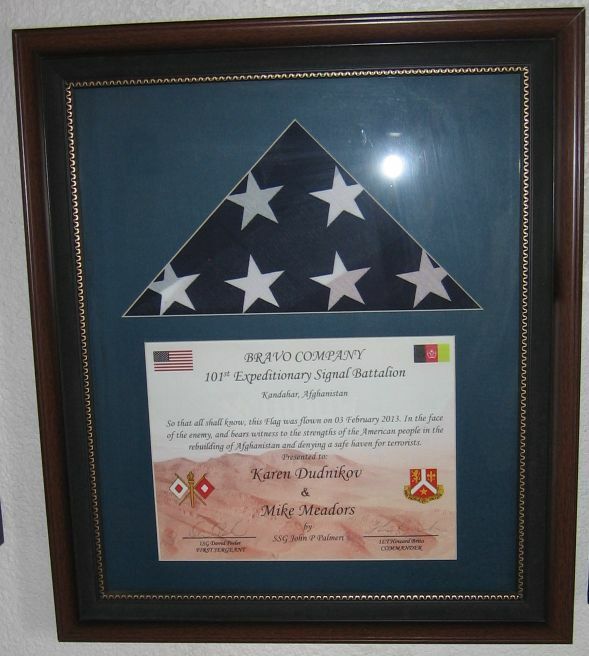 Our third American flag, in the large rectangular frame, has a certificate stating it was flown "in the face of the enemy" on February 3, 2013, by Bravo Company, 101st Expeditionary Signal Battalion, Kandahar, Afghanistan, sent to us by Staff Sergeant John P. Palmeri, one of our adopted soldiers through AdoptaPlatoon. SSG Palmeri also sent us three post cards after his unit received parcels from us. The framed flag was very unexpected..